How to Remove PewDiePie Ransomware? PewDiePie is the name of a well-known YouTuber. His channel has the most subscribers, currently hovering above 91 million. Though, he still holds the title, it’s quite the contested race. There’s a large channel that’s been on his tail, for months. It’s called T-Series. The web has thrived on this over-exaggerated ‘feud.’ So, naturally, it’s become a meme, at this point. Users, all over the world, pin the two channels against each other. And, root for one or the other, to win the title. For most people, it’s a fun game, with no real-life consequences. But, there are some, who have taken it to the next level. 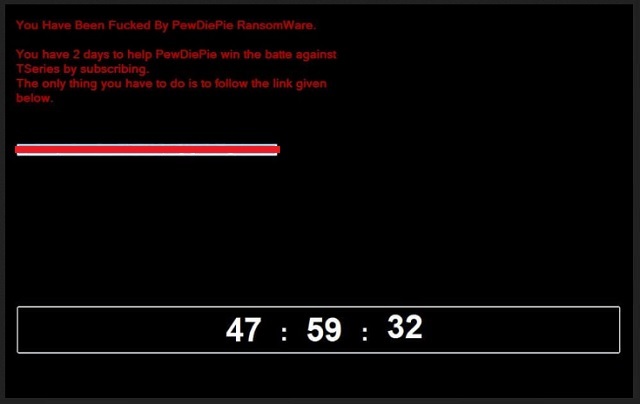 There’s now a PewDiePie ransomware, plaguing users. And, it’s not your typical one, either. Yes, it still encrypts your files, and lists demands. But, instead of demanding money, it requests you subscribe to PewDiePie. That’s right. It states, that, if you wish to decrypt your data, you must click the provided link. In doing so, it automatically subscribes you to the channel. Or, so it says. Despite it all sounding fun, you can’t be to careful, when it comes to cyber criminals. Click nothing. Don’t engage with the cyber kidnappers. Compliance tends to worsen your predicament, in these cases, and not improve it. So, don’t comply. And, if you wish to subscribe to PewDiePie, do it on your own accord. And, not via shady links, provided by cyber extortionists. The PewDiePie ransomware makes its way into your PC, via trickery. It uses the old but gold invasive methods. Like, hiding behind corrupted sites, links, or torrents. Or, fake updates and freeware. And, of course, spam emails. Spam emails provide, arguably, the easiest entry point. You get an email that seems legitimate. It appears to come from a well-known company, like Amazon or PayPal. Open it, and it claims you have to verify private information, or confirm a purchase. And, then, states you must click a link, or download an attachment, to do so. It’s all lies. Don’t buy into it. Infections, like ransomware, prey on your carelessness. They hope you don’t notice the deception. That you’re too careless to catch the cyber threat in the act of attempting invasion. Don’t ease the cyber threat’s entry. Always take the time to be vigilant. Look for the fine print, and double-check everything. Read terms and conditions, and know what you say YES to. Caution is crucial, if you wish to keep an infection-free PC. Don’t give into gullibility, and distraction. Don’t rush. Choose caution over carelessness. One keeps trouble out, and the other invites it in. You may recognize the PewDiePie name, from YouTube, but you’re now the victim of a ransomware. And, that’s hardly a fun experience. Once the infection slithers into your system, be wary. It doesn’t take long before it strikes. The tool uses unique encryption algorithms to lock your data. It targets every single file, you have on your computer. Documents, archives, pictures, videos, music. Nothing escapes its reach. The ransomware attaches the ‘.hwuwhdw‘ extension to solidify its grip. After it appends the extension, your files turn unusable. The only way to make them accessible again, is to comply. You’re expected to click the provided link, subscribing to PewDiePie. And, you get 2 days to do so. But, here’s the thing. Though this seems like fun and games, on the surface, you can’t know that’s all it is. You have no assurances that it all ends with a simple click, and a YouTube subscription. What if the link turns out to be malicious? What if it deteriorates your system’s performance even more? What if your data remains locked, despite your compliance? You have ZERO guarantees that following the instructions has a positive outcome. Don’t gamble with your system’s well-being. Whether it’s just another meme, or a grave threat, masquerading as one, don’t take chances. Don’t comply. Locate any suspicious processes associated with PewDiePie encryption Virus. PewDiePie may have the ability to replicate itself, if not completely cleaned. This may require tracking down hundreds of files and registry keys. You can choose to use Spyhunter Professional Anti-Malware Program to deal with any infection that might be lurking along with PewDiePie!